I was up at 6 this morning, had my quiet time, ate a light breakfast, walked 4 miles on the treadmill, showered, dressed, reviewed the Sunday school lesson and the sermon for this morning. 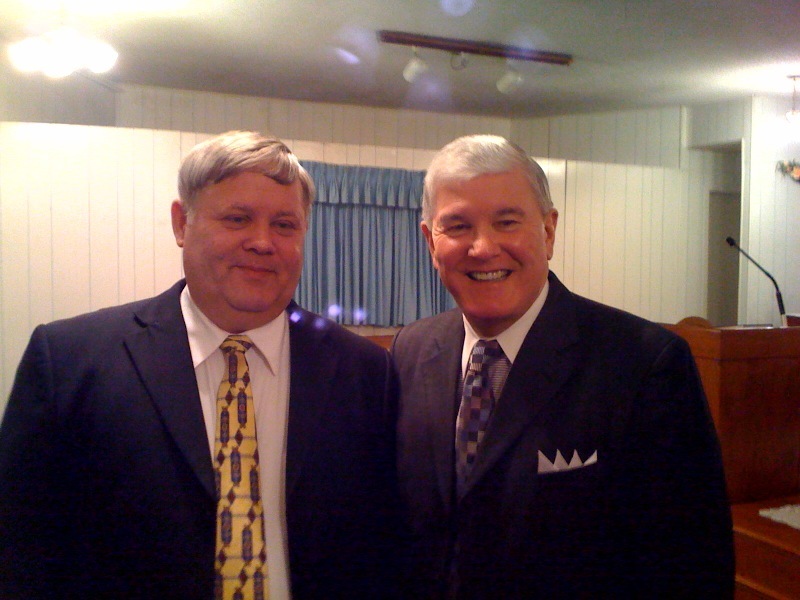 Pastor Philip Winn is the pastor of the Westside Baptist Church of Durant, Oklahoma. He is a faithful soul winner and I am glad to call him friend! His dear wife is having some tests done and they suspect cancer. Please remember to pray for Mrs. Winn. I called Mrs. Gray and checked on her and the poodle. The poodle’s name is Peaches. I wanted to buy two of them and name them Peaches and Cream! Ha! Mother and poodle were just waking up when I called. Poor thing! She has it so rough! I called my converts this morning and God gave me two for the water in two different churches. God gave me 6 souls going into tonight’s service. Gotta love soul winning! I preached tonight on “Motives vs. Works.” I Corinthians 3:11-15 was the Scripture that I used. This is referring to the Judgment Seat of Christ. The sins of the redeemed were paid for at Calvary through the Son of God Jesus Christ. At the Judgment Seat of Christ there will be a judgment of the saved ones “work” according to these verses. It does say we will be judged by “why” we do but rather “what” we do. There will be non-rewarded works and rewarded works at this Judgment Seat of Christ. Just as at the Great White Throne Judgment the unsaved will have their sins judged and degrees of punishment in Hell the saved will have their works judged and there will be degrees of rewards. There are two groups of things to be judged. Look at verse 12 and you will find these two groups. One is “gold, silver, and precious stones.” The second group is “wood, hay, and stubble.” The first group cannot be burned only purified via fire, but the second group can be burned. Wood, hay and stubble is that which we do for this world while gold, silver, and precious stones represents that which we do for Heaven or the eternal. Live for the eternal and not the temporal and you will enjoy the Judgment Seat of Christ. Gotta love serving the Lord!